Mouser Electronics, Inc., the industry’s leading New Product Introduction (NPI) distributor with the widest selection of semiconductors and electronic components, is now stocking the ADE9000 analog front end (AFE) from Analog Devices. The ADE9000 is a highly integrated polyphase AFE with power quality analysis designed to help extend the health and life of industrial equipment while saving developers significant time and cost over custom solutions. 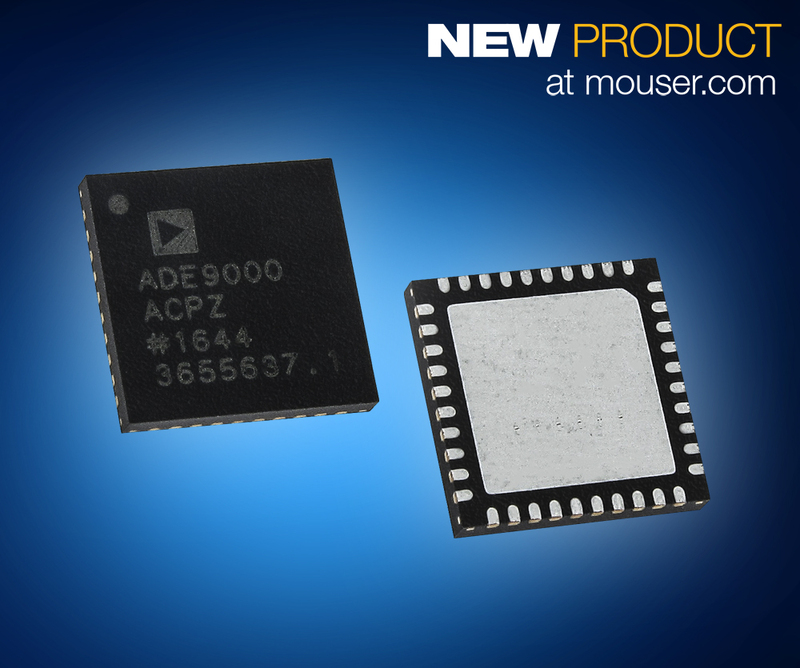 Analog Devices’ ADE9000 AFE, available from Mouser Electronics, is an off-the-shelf solution with embedded power quality algorithms and integrated with high-performance analog-to-digital converters (ADCs) in a single device. This integration simplifies additional complex algorithm programming, reduces cost and component count, and increases speed to market while still achieving high accuracy and enabling EN61000-4-30 Class S for power quality. The AFE simplifies the implementation of energy and power quality monitoring systems by providing tight integration of acquisition and calculation engines. Superior analog performance and a digital signal processing (DSP) core enable accurate energy monitoring over a wide dynamic range. An integrated high end reference ensures low drift over temperature with a combined drift of less than ±25 ppm/degrees Celsius maximum for the entire channel. The ADE9000 AFE enables designers of power quality monitoring solutions to measure and analyze disturbances and variations in the power supply in order to prevent these disruptions and long-term damage, primarily for three-phase power meters. The integrated ADCs and DSP engine calculate various parameters and provide data through user accessible registers or indicate events through interrupt pins. For development, Mouser also stocks the EVAL-ADE9000EBZ evaluation board, which connects to the EVAL-SDP-CB1Z board to allow engineers to evaluate the performance of the ADE9000 AFE. To learn more about the ADE9000 AFE and evaluation board, visit http://www.mouser.com/new/Analog-Devices/adi-ade9000-afe/.